Divorce can be a trickier business than you might realize if you’ve never been down the road before yourself. For example, we so often hear about visitation rights. Who most often gets primary custody of a child? The mother? The father? No matter what, one parent usually has to take a step back in order to let the other parent keep the lion’s share of these responsibilities. That means visitation. What happens to relationships with other family members? If the mother gets sole custody, and the father is cut out of the loop, do the paternal grandparents have rights? It depends on the circumstances, and local laws are important as well. In California, there is at least the possibility that a grandparent could gain visitation rights with a grandchild. What matters most is the relationship between the grandparent and the child before the divorce took place. 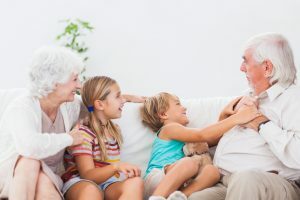 If the court can establish that a bond existed between child and grandparent, then naturally the legal system would do everything in its power to see that bond continue to strengthen through to adulthood. In order to prove that such a bond exists, though, it must also be proved that a continued relationship with the grandparent would benefit the child in the future. This isn’t always an easy thing to do. What really complicates the matter, however, is what the parent with custody wants for his or her child. The court is granted the authority to perform a balancing act in the interest of doing so. Even if visitation is in the best interest of the child, the decision-making rights of the parent will often still take priority. It should be mentioned that these rules are contingent on the status of the couple in question. If the couple is still married, then visitation rights will likely not be granted. If the parents are married but separated and living apart, then the option is still there. If a grandparent has the support of a parent, then the option is still there. If neither parent is currently guardian to the child, then the option is still there. Those are the basic rules governing the issue, but as you can see it can be a convoluted mess to navigate these laws and restrictions without a lawyer. In order to begin the process, it is strongly recommended you seek legal counsel beforehand. When you have an idea of what you would like to do, then you can petition for visitation rights with the court overseeing custody. Because it isn’t always obvious where to file this petition, a lawyer can help shed some light on what would otherwise feel like an impossible situation. Comments Off on Do Grandparents Have Visitation Rights? « What Are Foreign Divorce Decrees? What Is Parental Alienation And How Does It Affect A Divorce? Can I Divorce If My Partner Won’t Sign The Papers? Should You Divorce After Domestic Violence Or Abuse? What Do Statistics Say About Child Custody During Divorce?